Here we are at last: baseball is back. Whilst Andy Williams may sing that Christmas is ‘the most wonderful time of the year,’ the start of the MLB regular season is every bit as exciting for those of us that follow the sport. It feels a long time coming, even with all of the off-season trades, signings and rumours, and the fact that the 2016 season ended up with a thrilling World Series makes the anticipation all the stronger for it all to get going again. No sport is predictable, least of all one with a regular season containing 2430 games, yet it’s fair to say the 2017 MLB predictions currently going up online are following a similar pattern. There’s no hiding that the five National League play-off teams from last season are most likely to be playing post-season baseball again this year. The reigning World Series champions Chicago Cubs are the team to beat in the Central, with the Washington Nationals and New York Mets, and the Los Angeles Dodgers and San Francisco Giants, looking good to battle it out for the East, West and two Wild Card spots. That doesn’t mean it’s going to be uneventful, even if those teams do come out on top. As for the outsiders, the St Louis Cardinals and Pittsburgh Pirates are the obvious teams that could get in the Wild Card mix. The Arizona Diamondbacks could get into the running too if their bad luck from 2016 turns to good luck in 2017. It will also be worth keeping an eye on the rebuilding Atlanta Braves who have now built their new ballpark and are getting closer to building a team that can get them back to their glory days. The American League looks more open, other than the strong likelihood of the Cleveland Indians winning the Central division (with the Detroit Tigers probably set to trade a few players away before the August deadline). There are genuinely three teams that could win the AL East, never mind compete for a Wild Card, in the Boston Red Sox, Baltimore Orioles and Toronto Blue Jays. It’s possible the New York Yankees could also make a play-off push if their young players continue to impress enough to make the team make some further additions in the summer. There could also be three teams in the mix in the West. The Texas Rangers are the team to beat, but arguably they over-performed with their 95 wins last season and both the Houston Astros and Seattle Mariners have been active over the off-season. 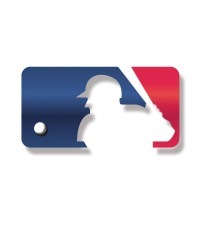 NL East: Mets, NL Central: Cubs, NL West: Dodgers, WC: Nationals and Giants. AL East: Red Sox, AL Central: Indians, AL West: Astros, WC: Blue Jays, Orioles. BT Sport offers plenty of games across the season so that there is a good TV option for UK-based fans; however ‘plenty of games’ isn’t the same as ‘all the games’ and that’s what makes MLB.TV such an essential purchase for me. Monday will show that straight away as MLB.TV subscribers can flick between a whole host of early starts during the British evening. I’ll then be able to get up in the early hours and watch the Oakland A’s season-opener too. Rule #1: there’s no such thing as too much baseball. Okay, not much use as a ‘to-do list’ for you reading this now, but hopefully you’ve already planned ahead. I book up the first few working days of the MLB season as annual leave as soon as I can to make sure I can enjoy the first few evenings (and early mornings) without having to get up to go to work straight after. This will be my twelfth season running BaseballGB and regular visitors will know that one of the features here is a guide published every Monday setting out the ‘early’ games (day-games in the States and that are in the evening UK time) for the week ahead. There are 25 early starts from Monday to Friday this coming working week. I refer you back to rule #1! Much as I try to catch all of the teams on a regular basis, my primary focus is on the Oakland A’s. 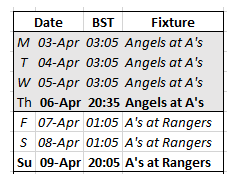 I’ve printed out an A’s game schedule for April that lists the games with start times in BST, blocks them into each individual series against different teams and highlights the day-games. The A’s have eight series in April and all but one – a mid-week three-game set in Anaheim near the end of the month – have at least one day-game scheduled. I find it’s useful to have those set out so that you can plan around them and work out when best to add in some early-hour contests too (if, like me, your work gets in the way of watching every one). It’s not just the regular season you need to focus on, the fantasy season is important too. I’m not the most obsessive fantasy baseball player and my in-season strategy predominantly involves simply making sure I don’t make too many mistakes in leaving players on my active team that aren’t playing. So, setting up my pitching staff for the week ahead, mindful that plans may still change mid-week, is a key preparation job for me to remember. Tropicana Field isn’t the most aesthetically pleasing place to get the season started, but the play on the field should soon make us forget the surroundings. Tanaka faced the Rays five times last season and was dominant against them, whilst Archer’s 0-3 record against the Yankees in 2016 conceals how well he pitched against them. Zack Greinke and the D-Backs will be intent on putting a hugely disappointing 2016 behind them and they would get an immediate confidence boost if they can get the better of MadBum and the Giants to start the season at Chase Field. Finally, the Cubs enter an MLB season as reigning champions for the first time since 1909 and where better to celebrate that than at the home of their bitter rivals. I’m sure St Louis will be gracious hosts.